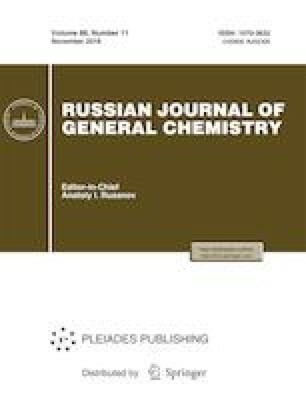 The steric structure of the cone and 1,3-alternate stereoisomers of p-tert-butylthiacalixarenes bearing in the lower rim four substituents containing amide and ammonium groups as well as L-tryptophan residues was studied by 1Н, 13С, 1Н–1Н NOESY, and 1Н–13С HSQC NMR spectroscopy. The mutual repulsion of the charged ammonium groups and the presence of intramolecular hydrogen bonds in the synthesized compounds can make the peptide bond with the tryptophan residue sterically accessible for enzymes. Original Russian Text © P.L. Padnya, O.S. Potrekeeva, E.E. Bayarashov, I.I. Stoikov, 2018, published in Zhurnal Obshchei Khimii, 2018, Vol. 88, No. 11, pp. 1851–1857.